Monday was depressing. I saw Mom, Dad and one youngster. The youngster was the same one I had been seeing. I began to consider the high mortality rate of coyote pups. There had been seven pups and I wondered somberly if now there was but one. Tuesday I saw Mom, Dad and two pups in their field. They were on their north-south dirt road about 130 yards from where I stood on the river bank. Did I actually see a third pup? I’m not so sure in the Mystery Stage Right photograph that it is Mom on the far right. 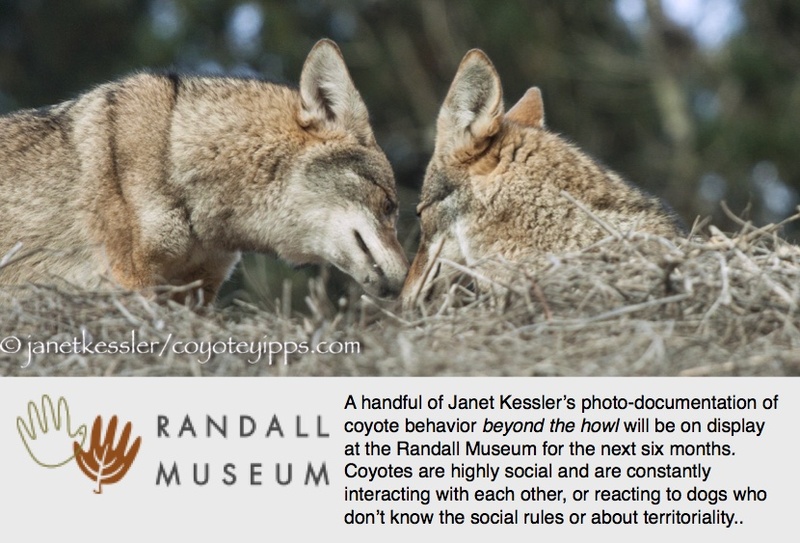 The other three coyotes in that picture don’t include Mom, in my opinion. Those three definitely include Dad, and most probably the two pictured are PupF1 and PupBig1, where one is probably female and the larger pup may not be. It is difficult to keep my eyes on one coyote at dusk. It is difficult to photograph one coyote at dusk and more difficult to photograph several. Each moves around. They come together, they wander away from each other, meet up, run off again, rest, hide and reappear. I snap a few shots of some and then look for where the others went. All the while it gets darker. The alpha male and female don’t like me and darkness gives either an opportunity to get uncomfortably close. Consequently I also need to scan the foreground and my immediate left and right. My dog helps although he gets distracted by itches, flying insects, lizards, joggers, bicyclists, dog walkers, odd sounds and bouts of impatience. Events develop quickly. I take pictures and on the way home my memory fades. Images help yet don’t resolve every uncertainty. There may have been a third pup. Yet Dad left for their den with two while Mom, following in the rear, was by herself. I still hope they didn’t return to an empty den area, the high mortality rate of pups notwithstanding. Mom and PupF1 waited quietly together. The real action began when PupBig1 approached them. Mom didn’t look like she was pleased with her pup’s leg action. The youngsters saw Dad coming and they left Mom and ran to him at full speed. Neither parent, when greeted, seemed interested in play. After the rendezvous the pups ran ahead towards the den area. Mom and Dad followed slowly, investigating odors and marking along the way. At least one pup ran back to them, remained with them a bit and then ran back to be with its sibling. Dad was the first to join them near the den area while Mom seemed to linger to watch me. At that point I left. All of them had seen me from the start. My effect on them was to slow them down. Mom was already watching me when the first pup joined her, and had joined her after observing me. The second one retreated upon spotting me, waited and then went to greet Mom and the other. I didn’t see Dad until he was greeted and assume he had long since spotted me. Bicyclists, a father and his three children, stopped to watch my coyotes and left satisfied after a few minutes. A couple of walkers did also. The bike path was busier for my being early. I suspect my coyotes were more tolerant of me for perceiving themselves as outnumbered. Tuesday was not depressing.